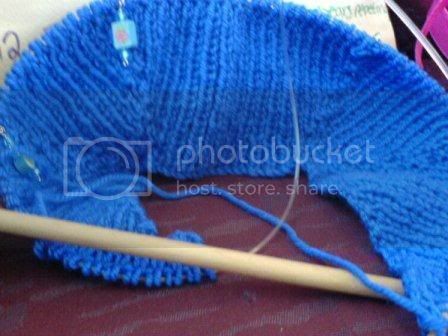 I've never done it myself, but I'm asuming she just did a basic cable within the raglan shaping. So instead of having one stitch marker have one stitch marker, enough space for the cable pattern, then another stitch marker. The increases are also yarn overs to get that lacy look. Oh well, photos when that is fixed. It's discouraging, but I love doing it so it's okay. Then just the sleeves left! Sweet Marie! That sweater is awesome! Hmm...I agree that it's just a matter of adding in small side panels before and after the YOs, but the effect is amazing. I am so conflicted. I have to finish at least another sweater before I can start another on eof these. I finally finished my first long sleeve sweater last night. It was not made in the round., and boy was all that seaming tedious! 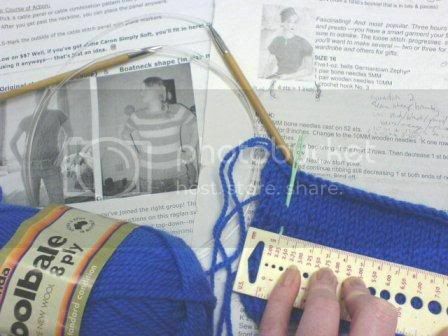 Knitting is the perfect procrastination tool! Okay, I really hope that I'm not jinxing myself by posting but I started my top down raglan (long sleeved boat neck) in Simply Soft Heathers (deep plum heather). I had originally wanted to make it out of regular SS in country blue but the deep plum caught my eye when I was at Walmart the other day so I temporarily ditched the country blue and started up with the deep plum. I'll probably use the country blue for another sweater (I'm really liking that cabled one that punkcatknitter did so I might use it for that one...). After a few false starts, I'm finally about 7 inches into it. Hopefully, by later tonight, I'll be done with the sleeve increases. I really love everyone's sweaters and it's inspiring me to get moving on mine. Depending on how tight it is, and if it's just the BO or the last few inches, you might be able to BO with a larger needle. I am using Panda Woolbale in what I am told is a royal blue. It is not a worsted weight, it is lighter. That is to help cope with the fact that I am trying to make mine in the style of the 3 Hour Sweater. Erm, yeah... clearly I have lost my mind Well, at least it will have short sleeves then. It is working up quite quickly, considering. Not sure if I can put up with what 1x1 rib looks like combined with the raglan increases though. I have nearly knitted my full shoulders width's worth. Does that make sense? If not I'm sorry, I'm over tired today. I'm still making my one of these too, although I'm going to undo the bind off, add some more ribbing and bind off more loosely. That's a great colour Miss_Vicki! I think that it will end up nicely. I am a few rows away from having enough stitches on the needles to place the sleeves on waste yarn so I can continue with the body!! I seriously love how fast this knits! I did go ahead with the cable idea, The yarn just seems natural for it. I am going pretty simple. The main cable runs down the center of the arm and is 6 sts wide.... I also decided that it needed a bit of companionship, so each sleeve also has a smaller cable on either side of the main, centerline. No pics today gang, sorry..... I am not actually sure where the darn thing is. oops. Miss Vicki, the colour is great, it's always handy to have a great base blue sweater!